The Dornier 228-212 is 19 seat twin-turboprop powered, STOL utility aircraft designed; engineered and built by Dornier Luftfahrt GmbH in Oberpfaffenhofen, Germany. Today, the Dornier 228 is produced by RUAG Aerospace Services GmbH in Oberpfaffenhofen as the Dornier 228NG. The Dornier 228 is also license-built by HAL, Hindustan Aeronautics Limited in India as the HAL Dornier Do-228. Development of the 228 started in the late 1970's. Dornier carried out extensive research into new technology wing design and converted a Do.28D-2 Skyservant into its "TNT" prototype for the advanced "Tragflügels Neuer Technologie" programme. This Dornier Do.28E TNT prototype (D-IFNT c/n 4330) was fitted with two Pratt & Whitney Canada PT6A-110 turboprop engines and flown first on 14 June 1979. Dornier changed the engine and tested the new aircraft with two Garrett AiResearch TPE-331-5 engines. Two Do.228 prototypes were built. The first prototype Do 228-100, initial designated Do28 E-1, (D-IFNS c/n 4358) took off on its maiden flight on 28 March 1981. The second prototype Do 228-200, initial designated Do28 E-2, (D-ICDO c/n 4359) flew on 9 May 1981. The Do.228 was fitted with the new TNT wing and built in the 15-passenger Do.228-100 and 19-passenger Do.228-200 versions. The Do.228 fuselage incorporated sections of Do.28D structure but was, essentially, a completely new design. The turboprop engines are mounted on is high wing and a retractable tricycle undercarriage is fitted. On 18 December 1981, the Dornier Do 228-100 received its German Type Certificate as Do.28, later renamed in the TCDS as Dornier 228. On 7 September 1982, the Dornier 228-200 received its German Type Certificate. Certification from both British and American aviation authorities followed on 17 April and 11 May 1984 respectively. The first customer delivery, to A/S Norving, took place on 3 March 1982. In November 1983, Hindustan Aeronautics (HAL) bought a production licence to manufacture the aircraft Kanpur, India, for the Asian market. Over the years, Dornier offered the 228 in upgraded variants and fitted with optional equipment for performing various special missions. In 1996, it was announced that all manufacturing operations would be transferred to India. In 1998, production of the Dornier 228 in Oberpfaffenhofen near Munich came to an end. In the period 1 June 2000 - 27 July 2003, the Type Certificate Holder was Fairchild Dornier GmbH, and since 28 July 2003, RUAG Aerospace Services GmbH, Oberpfaffenhofen Airfield, is the Type Certificate Holder. In 2009, RUAG started building a Dornier 228 New Generation in Germany with the fuselage, wings and tail unit manufactured by Hindustan Aeronautics Limited (HAL) in Kanpur, India, and transported to Oberpfaffenhofen, where RUAG Aviation carries out aircraft final assembly, customized equipment installation, product conformity inspection and aircraft delivery. It is basically the same aircraft with improved technologies and performances, such as a new five blade propeller, glass cockpit and longer range. The first delivery was made in September 2010. Over 400 Do 228s in all variants have been produced in Germany and India. The 1991-built Dornier 228-212 c/n 8205 (unit 205) was testflown as D-CBDH and delivered as D-CAAM to Arcus Air Logistic GmbH in November 1991. Arcus-Air Logistic is an airline based in Troisdorf, Germany, operating chartered cargo and corporate flights out of Mannheim City Airport. 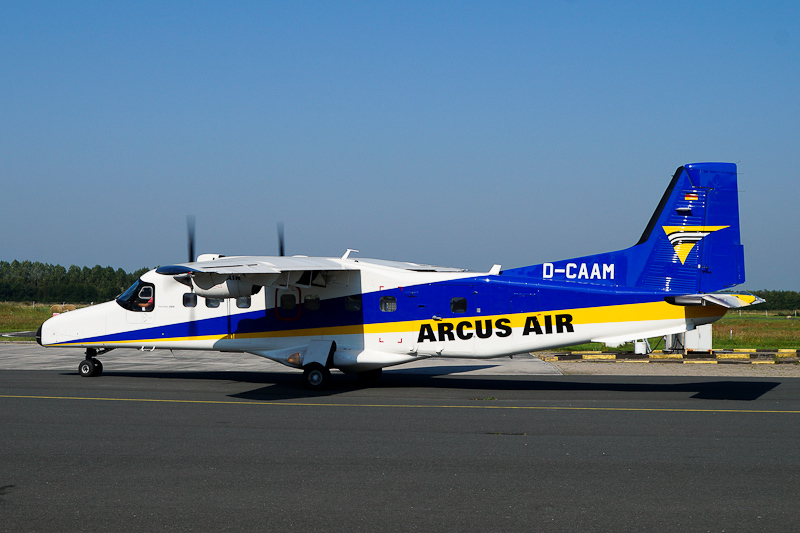 On 14 September 2016, the Arcus Air Dornier 228 D-CAAM was seen at Emden airfield.